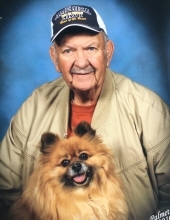 Westminster– John Joseph Lee Edens, 80, of 105 Pleasant Ridge Drive, passed away, January 26, 2019, at his residence. Born in Charlotte, NC, he was the son of the late James Kenneth Edens and Mary Catherine Culpepper Edens. John worked as a security officer at Michelin. He attended Bethel Baptist Church and was an avid wood worker. John was a veteran in the United States Navy and served on the USS Yorktown. Mr. Edens is survived by his former spouse, Patricia Edens; son, Bobby Edens of Westminster; brother, Robert Edens of Martin, GA; three grandchildren and one great-grandchild. In addition to his parents, he is preceded in death by sons, Christopher Edens and Kenneth Edens; and brother, James Edens II. A graveside service will be held at 2 pm, Thursday, January 31, 2019 at the Old Stone Church Cemetery in Clemson. The family will receive friends at the residence. In lieu of flowers, memorials may be made in Mr. Edens memory to St Judes Childrens Hospital, 507 St. Jude Place, Memphis, TN 38105. Condolences may be expressed online by visiting www.sandiferfuneralhome.com. To send flowers or a remembrance gift to the family of John Joseph Lee Edens, please visit our Tribute Store. "Email Address" would like to share the life celebration of John Joseph Lee Edens. Click on the "link" to go to share a favorite memory or leave a condolence message for the family.